HMI Application Development & PLC Programming – Portland Engineering, Inc.
Human Machine Interface (HMI) or Operator Interface (OI) is the part of the machine that handles the human machine interaction. 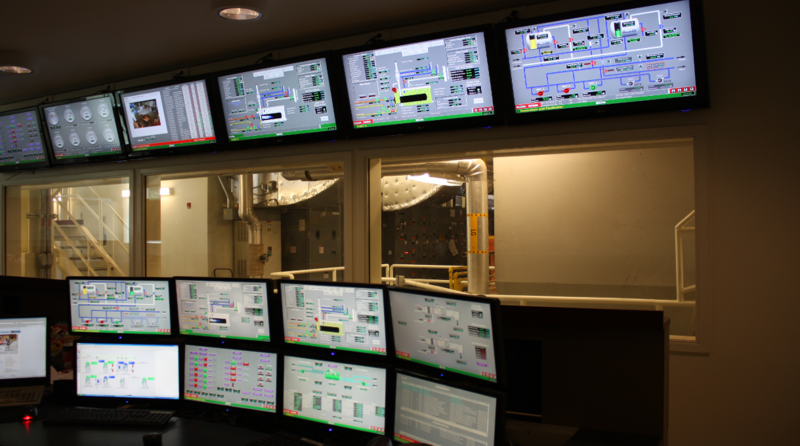 The goal of any well designed HMI should be to allow the effective operation and control of the machine from the human end while the machine simultaneously feeds back information that aids the operators decision making process. At Portland Engineering we specialize in full spectrum HMI/OI design engineering services that are clear, concise, and responsive. We know that information is important and that as humans we can only pay full attention to one thing at a time, so we minimize novelty without compromising aesthetics. Because we have been designing and programming HMI/OI for so long, we also understand that certain elements should be familiar and consistent. Our designs are always responsive and never sluggish, they are consistent across the application, and they are designed with efficiency in mind. A programmable logic controller, PLC or programmable controller is a digital computer used for automation of industrial electromechanical processes, such as control of machinery on factory assembly lines. PLCs are used in many industries and machines. PLCs are designed for multiple analog and digital inputs and output arrangements, extended temperature ranges, immunity to electrical noise, and resistance to vibration and impact. Programs to control machine operation are typically stored in battery-backed-up or non-volatile memory. A PLC is an example of a "hard" real-time system since output results must be produced in response to input conditions within a limited time, otherwise unintended operation will result. Before the PLC, control, sequencing, and safety interlock logic for manufacturing automobiles was mainly composed of relays, cam timers, drum sequencers, and dedicated closed-loop controllers. Since these could number in the hundreds or even thousands, the process for updating such facilities for the yearly model change-over was very time consuming and expensive, as electricians needed to individually rewire the relays to change their operational characteristics. Digital computers, being general-purpose programmable devices, were soon applied to control of industrial processes. Early computers required specialist programmers, and stringent operating environmental control for temperature, cleanliness, and power quality. Using a general-purpose computer for process control required protecting the computer from the plant floor conditions. An industrial control computer would have several attributes: it would tolerate the shop-floor environment, it would support discrete (bit-form) input and output in an easily extensible manner, it would not require years of training to use, and it would permit its operation to be monitored. The response time of any computer system must be fast enough to be useful for control; the required speed varying according to the nature of the process. Since many industrial processes have timescales easily addressed by millisecond response times, modern (fast, small, reliable) electronics greatly facilitate building reliable controllers, especially because performance can be traded off for reliability. The functionality of the PLC has evolved over the years to include sequential relay control, motion control, process control, distributed control systems and networking. The data handling, storage, processing power and communication capabilities of some modern PLCs are approximately equivalent to desktop computers. PLC-like programming combined with remote I/O hardware, allow a general-purpose desktop computer to overlap some PLCs in certain applications. Desktop computer controllers have not been generally accepted in heavy industry because the desktop computers run on less stable operating systems than do PLCs, and because the desktop computer hardware is typically not designed to the same levels of tolerance to temperature, humidity, vibration, and longevity as the processors used in PLCs. Operating systems such as Windows do not lend themselves to deterministic logic execution, with the result that the controller may not always respond to changes of input status with the consistency in timing expected from PLCs. Desktop logic applications find use in less critical situations, such as laboratory automation and use in small facilities where the application is less demanding and critical, because they are generally much less expensive than PLCs. The main difference from other computers is that PLCs are armored for severe conditions (such as dust, moisture, heat, cold) and have the facility for extensive input/output (I/O) arrangements. These connect the PLC to sensors and actuators. PLCs read limit switches, analog process variables (such as temperature and pressure), and the positions of complex positioning systems. On the actuator side, PLCs operate electric motors, pneumatic or hydraulic cylinders, magnetic relays, solenoids, or analog outputs. The input/output arrangements may be built into a simple PLC, or the PLC may have external I/O modules attached to a computer network that plugs into the PLC. As PLCs became more advanced, methods were developed to change the sequence of ladder execution, and subroutines were implemented. This simplified programming could be used to save scan time for high-speed processes; for example, parts of the program used only for setting up the machine could be segregated from those parts required to operate at higher speed. Special-purpose I/O modules may be used where the scan time of the PLC is too long to allow predictable performance. Precision timing modules, or counter modules for use with shaft encoders, are used where the scan time would be too long to reliably count pulses or detect the sense of rotation of an encoder. The relatively slow PLC can still interpret the counted values to control a machine, but the accumulation of pulses is done by a dedicated module that is unaffected by the speed of the program execution. Modular PLCs have a chassis (also called a rack) into which are placed modules with different functions. The processor and selection of I/O modules are customized for the particular application. Several racks can be administered by a single processor, and may have thousands of inputs and outputs. A special high speed serial I/O link is used so that racks can be distributed away from the processor, reducing the wiring costs for large plants. PLCs have built in communications ports, usually 9-pin RS-232, but optionally EIA-485 or Ethernet. Modbus, BACnet or DF1 is usually included as one of the communications protocols. Other options include various fieldbuses such as DeviceNet or Profibus. Most modern PLCs can communicate over a network to some other system, such as a computer running a SCADA system or web browser, and can be interacted with via HMI. While the fundamental concepts of PLC programming are common to all manufacturers, differences in I/O addressing, memory organization and instruction sets mean that PLC programs are never perfectly interchangeable between different makers. Even within the same product line of a single manufacturer, different models may not be directly compatible. In order to properly understand the operation of a PLC, it is necessary to spend considerable time programming, testing, and debugging PLC programs. PLC systems are inherently expensive, and down-time is often very costly. In addition, if a PLC is programmed incorrectly it can result in lost productivity and dangerous conditions. PLC simulation software is a valuable tool in the understanding and learning of PLCs and to keep this knowledge refreshed and up to date. PLCs are well adapted to a range of automation tasks. These are typically industrial processes in manufacturing where the cost of developing and maintaining the automation system is high relative to the total cost of the automation, and where changes to the system would be expected during its operational life. At Portland Engineering we are a registered systems integrator for Wonderware, Allen-Bradley/Rockwell Automation, Matrikon, Ignition and InduSoft; and we work with all major brands of PLC hardware and software. As control system integrators, there is not a single one of our 200 annual products that does not involve interacting with a PLC in some way. We have more than twenty years of experience providing design engineering and programming services for Programmable Logic Controllers in all types of industries. 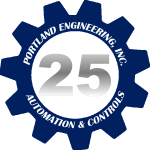 If you need help with anything involving a PLC, consider Portland Engineering your resource, anytime, period. Screen development, design, engineering, deployment; Information Systems and Information Integration; Supervisory Control and Data Acquisition Systems; Telemetry Systems. PLC Programming; Advanced Control; Automated Assembly; Batch Control & Batch Processing; Distributed Control Systems and DCS Migration; Dedicated Controls; Discrete Control; Energy Management; Factory Automation; Flow Control; Information Integration; Level Control; Manufacturing Execution Systems; Motors, Drives & Motion Control; Programmable Automation Controllers; Pressure Control; Process Control; Product Tracking, Identification, RFID, Barcodes & Matrix Codes; Pumps, Compressors & Turbines; Supervisory Control and Data Acquisition Systems; Telemetry Systems.